Truth be told, I have not always been a cake gal. As a child, I would have surely picked ice cream over sheet cake. My tastes have certainly changed over the years, but I will always have a huge sweet tooth. I love and work in pastry and I most definitely have my chocolate-craving days, but sometimes I just want some good old fashion candy. Now that I think about it, I do tend to favor classic candies. I picked salt water taffy as favors for our wedding, and I distinctly remember my husband teasing me for picking out a box of peanut brittle when selecting candy for a movie one time. One piece of candy that I always found so amusing is Ribbon Candy. I didn't even know such candy existed until I danced the role in The Nutcracker about 20 years ago. The pearly sheen of this colorful candy is eye-catching and the shape so whimsical and festive. 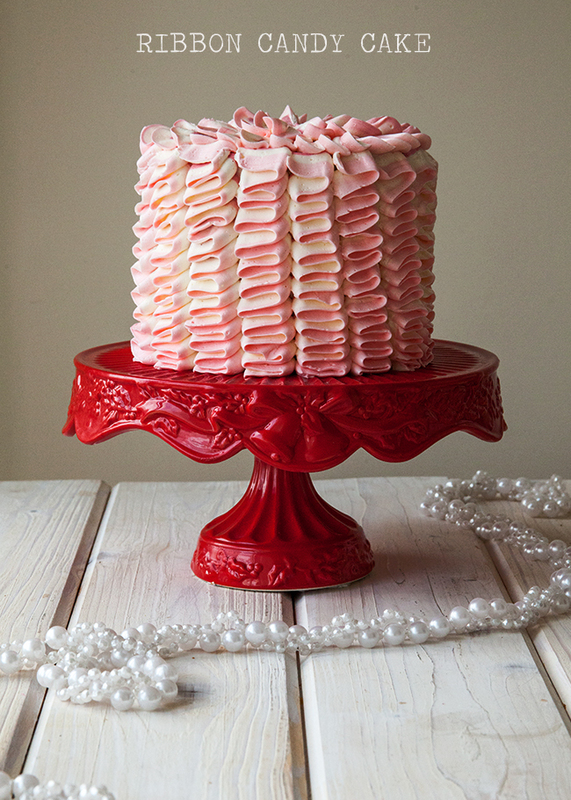 If you've seen my previous work, then you could probably guess how much l love those ruffles. I'm intrigued by the colored stripes within the candy and was inspired to create a frosting technique to mimic this characteristic of ribbon candy. I've done the ribbon-ruffle-buttercream-cake before, so it was pretty clear what direction I would take to transform a classic Christmas candy into a new holiday dessert. The idea was fairly flawless in my head, although getting the job done was a bit tougher than I thought. I chose a color palette that consisted of various shades of pink and white and got to work. 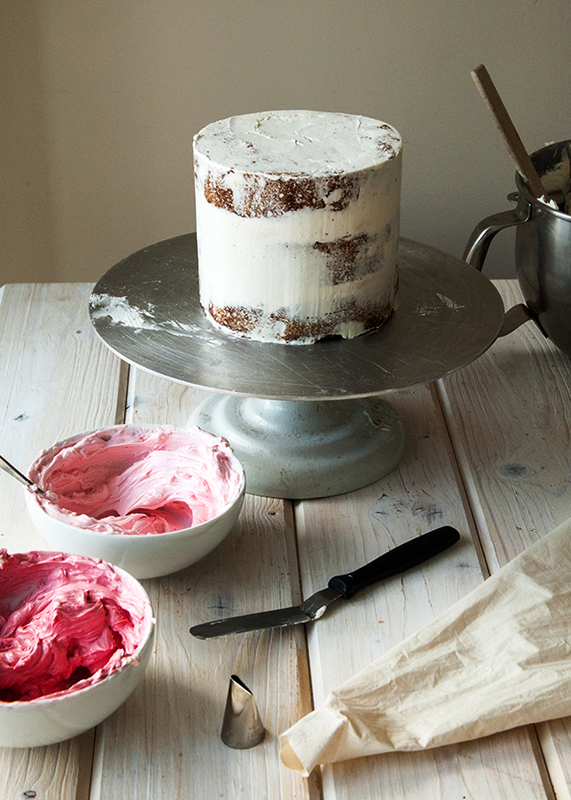 Give your cake a good, solid crumb coat. Divide your frosting and tint three different colors. Fit a pastry bag with a large petal tip. Using a small off-set spatula, carefully stripe the side of pastry bag with one of the colored icing making sure to place icing on the side of the bag that correlates with one of the points of the piping tip - not the flat sides. You'll have to take a peek into the bag while you do this to make sure. Fill an additional pastry bag fitted with a plain or round tip with the last color. Carefully squeeze in the icing from this bag into the center of the other bag - between the two colored stripes. Your bag should now be partially full with three different colors of icing. With the narrow point of the petal tip facing out, hold the piping bag perpendicular to your cake board or serving plate. Keeping even pressure, pipe just up against the side of the cake. 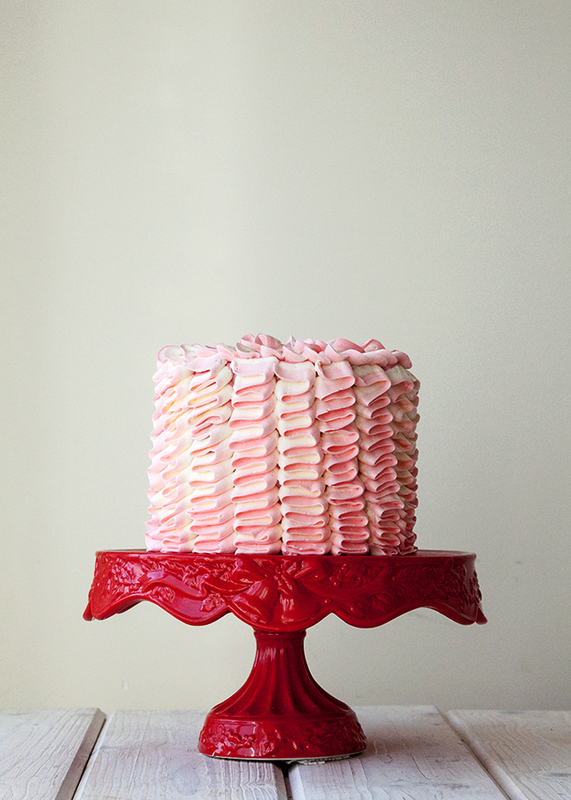 Starting from the bottom, pipe about 1 inch wide vertical rows, zig-zagging back and forth up to the top of the cake. The shape of the petal tip should create the ribbon ruffle look on its own. Continue to pipe rows around your cake until it is complete. For the top, pipe petal-like rings around your cake - spiraling into the center. Filling the bag may be a bit messy and tricky. I recommend only filling it up a little bit at a time. This may take time, especially with the three different colors, but it may help to stay organized. When filling the bag, remember that the narrow tip will be facing out, so stripe your bag with whichever color you want to show up the most on your cake. Don't fret if the colors start to run together a bit and are not perfectly uniform. It will be pretty regardless.